This super easy crockpot meatball hoagies five ingredient sandwich recipe cooks in just 4 to 6 hours and is a perfect solution for lunches at home. 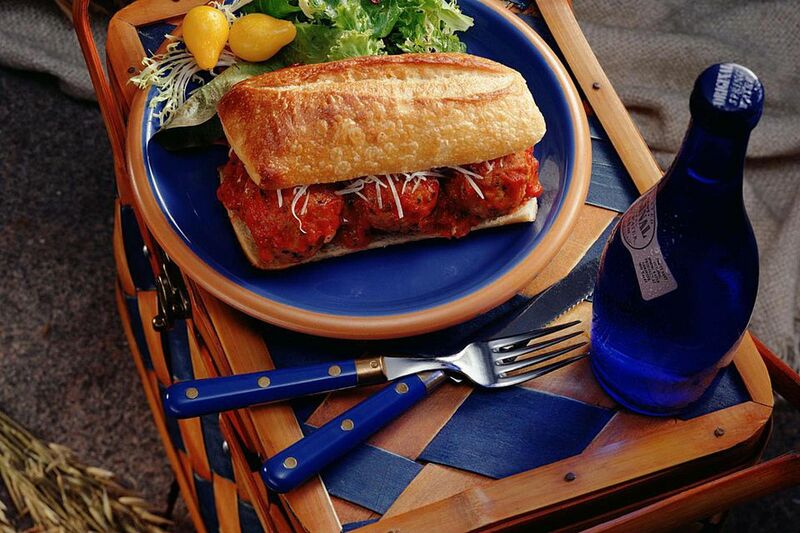 You can use your meatballs, or use frozen purchased fully cooked meatballs. The only stipulation is that the meatballs have to be fully cooked before they go into the slow cooker. Uncooked meatballs will release too much fat, and the finished product will be greasy. You could use other types of bread in place of the hoagie buns if you'd like in this easy recipe. Use ciabatta rolls, or make a big sandwich using halved French or Italian bread, and cut into individual servings. You can also vary the type of cheese you use. Mozzarella, provolone or fontina would be delicious melted on top of the meatballs and the spicy sauce. Just use a cheese that melts well. Combine the frozen meatballs, pasta sauce, and onion in a 3 to 4-quart slow cooker. Cover and cook on low heat for 4 to 6 hours, until the onion is tender and the meatballs are thoroughly heated to 160 F.
Place the meatballs in the toasted hoagie buns and top with cheese. At this point, you can let the cheese melt on the hot meatballs and sauce, or place them under the broiler for a few minutes to melt and brown the cheese.